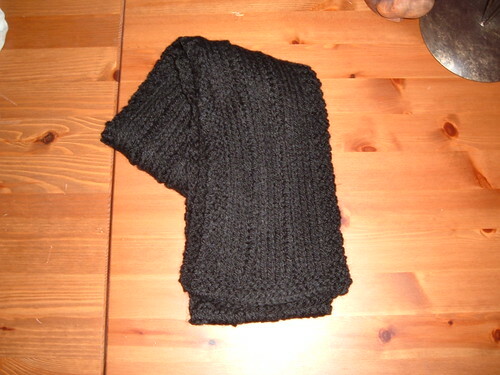 It’s made from the black chunky stuff left over from A’s cardigan, and only took a few evenings to get done. I didn’t find a pattern I liked so I just did a 3 stitch garter-stitch border each side and a 4-2 rib in the middle. Instead of blocking the wool content, I decided to kill the acrylic instead, and it ended up lovely and drapey and so soft. That done, I decided I had to also make a scarf for Ali for Christmas. With only a week until my last day in the office before the xmas break, it seemed obvious! Cast on another project! It’s very soft and drapey, sparkly and shiny and knitted using two different sized needles. 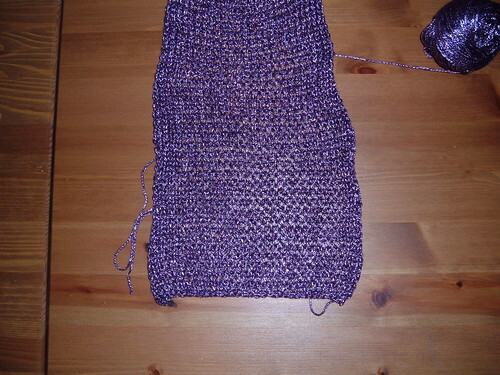 The knit side is on 5mm and the purl side on 8mm. Interesting effect, but hard to get across in a photo. So once again the shawl of doom is hibernating. I will get back to it eventually. 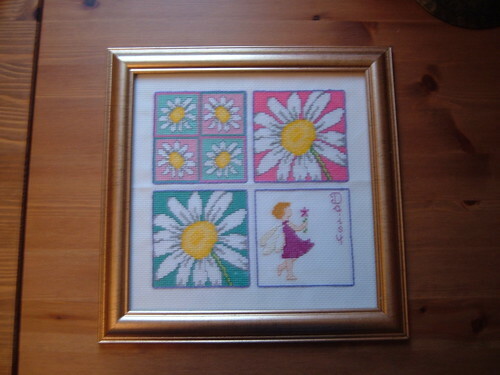 Also on hold are my Happy socks, and Amy’s cross-stitch picture. These can now be wrapped in tissue paper and passed on to A’s Mum to give to her sisters. In other news…not much really, lots of work, visits to Bristol, xmas shopping. This afternoon we’re planning to put up the xmas decorations – we were planning to have our nieces round for the night to help us with it, but plans changed so now it’s just me and Ebeneezer. A doesn’t like xmas decorations. Good news – I only have one more week to work then I’m off for 2 weeks. Bad news – I have a cold. 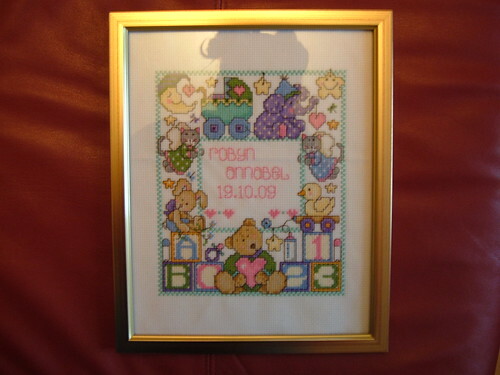 This entry was posted on December 12, 2009 at 11:19 am and is filed under Cross-Stitch, knitting. You can follow any responses to this entry through the RSS 2.0 feed. You can leave a response, or trackback from your own site.